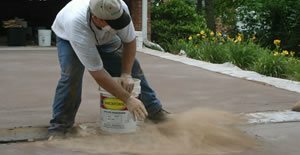 Most shake-on color hardeners are a blend of pigments, finely graded silica sand, wetting agents, and portland cement. Coloring options come in a wider array of hues than integral colors, including various shades of blue and green (see this page for color hardner suppliers). As the name implies, they also densify the concrete surface because they contain hard mineral aggregates and portland cement. The result is a surface that's stronger, more wear resistant, and less permeable to moisture and deicing chemicals than standard concrete. Where to use: Decorative contractors often use dry shakes to color stamped concrete or concrete overlays because the rich surface paste helps to produce sharper imprints. Hardeners also produce more robust tones than possible with integral pigments and permit greater variability. For example, contractors can apply one or more accent colors of hardener to achieve subtle tonal variations, such as you would see in natural stone. Because color hardeners improve the strength and density of the concrete surface, they are a great choice for exterior slabs exposed to freeze-thaw cycles and deicing salts and for interior floors exposed to heavy foot traffic and abrasion. Limitations: Because of their shake-on application, dry shakes generally are limited to use on horizontal surfaces. They also are messy to apply because some of the material goes airborne during broadcasting. That makes it necessary to protect adjacent buildings, landscaping, walls and existing slabs with plastic sheeting. This airborne powder can also be harmful to breathe, which may prohibit the use of dry shakes in occupied indoor spaces. Find a contractor in your area who specializes in colored concrete.